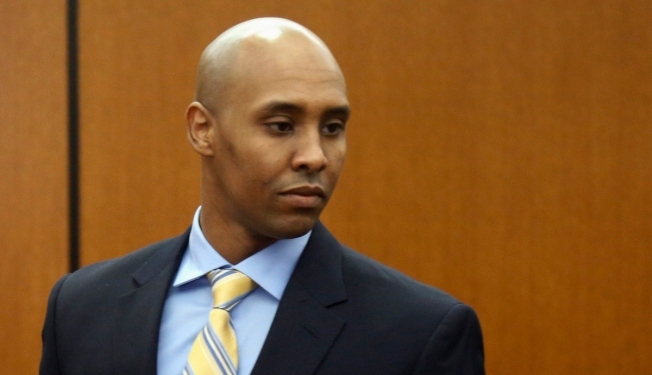 In this May 8, 2018, file photo, former Minneapolis police officer Mohamed Noor arrives at the Hennepin County Government Center for a hearing in Minneapolis. Prosecutors can use a former Minneapolis police officer's psychological records against him when he goes on trial next year for fatally shooting an unarmed Australian woman who had called 911, a judge ruled Thursday. Hennepin County District Judge Kathryn Quaintance set a trial date of April 1 after finding that there is probable cause for the criminal case to proceed against Mohamed Noor. He was charged in March with third-degree murder and second-degree manslaughter in the death of Justine Ruszczyk Damond. Damond, a 40-year-old life coach and dual citizen who was engaged to be married, called 911 the night of July 15, 2017, to report a possible sexual assault in the alley behind her home. Noor was in the passenger seat of a squad car when he reached across his partner and fired at Damond through the driver's window after she walked up to them in the darkness. Noor has declined to speak with investigators. But his partner, Matthew Harrity, told them they "got spooked" when she approached. Harrity said he heard a voice and a thump on the back of the squad, and glimpsed a head and shoulders outside. Harrity said he feared for his life and drew his gun. Noor, however, fired at Damond, who died at the scene. Noor's attorneys argue he acted reasonably because he feared he was in danger. But Quaintance ruled during the brief hearing that a jury could conclude from the evidence that Noor's actions that night met the legal tests for both charges. The judge also refused to suppress Noor's psychological records, which the Minneapolis Police Department collected during his hiring process. She ruled that they're not subject to the physician-patient privilege of confidentiality. According to court filings, the records show that training officers expressed concerns about Noor's fitness for duty long before the shooting. The trainers said he had problems handling job stress and engaging with people. And a psychological evaluation found he was more likely than other officer candidates to become impatient with others over minor infractions and have trouble getting along with others. Nevertheless, he was deemed fit to work as a cadet officer. Noor's attorneys countered that prosecutors painted a distorted picture of the records. They said in their filings that training officers never found Noor to be "unacceptable" at a task, and that a psychological test he took was racially biased. Noor is Somali-American. They said his results were likely a result of his race and culture, not a personality disorder. Quaintance also rejected a defense motion to dismiss the counts over comments by Hennepin County Attorney Mike Freeman that the defense said jeopardized Noor's right to a fair trial, though she advised both sides to be circumspect. "We are committed to a fair and just process," Quaintance said. "The issues will be tried in a court of law and not the media." An earlier version of this story contained an incorrect photo.